On June 30, the Delaware Senate passed a bill ensuring that incarcerated persons will be counted as residents of their home addresses when new state and local legislative districts are drawn in Delaware. The bill previously passed in the House, and is now awaiting Governor Jack Markell’s signature. 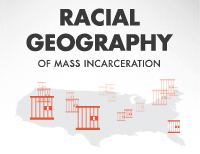 The U.S. Census currently counts incarcerated people as residents of the prison location. When states use Census counts to draw legislative districts, they unintentionally enhance the weight of a vote cast in districts that contain prisons at the expense of all other districts in the state. Delaware is the second state to correct this problem and adjust Census data to count incarcerated persons at their home address, joining Maryland which enacted a bill in April. Similar legislation is pending in New York. “The Delaware legislature has taken a much-needed step to reflect incarcerated populations in a more accurate way. Delaware’s action should help pave the way for other states to end the distortions caused by counting incarcerated persons in the wrong place,” said Brenda Wright, Director of the Democracy Program at Demos. The legislation, passed as HB384, applies only to redistricting and would not affect federal or state funding distributions. The Prison Policy Initiative and Demos have a national project to end prison-based gerrymandering, seeking to change how the U.S. Census counts incarcerated people and how states and local governments use prison counts when drawing districts. The two groups provided technical assistance in support of Delaware’s reform. The Prison Policy Initiative and Demos long have advocated for the Census Bureau to change its practices so that incarcerated persons would be counted at their home residences on a nationwide basis. While it is too late for that change to be made for the 2010 Census, the Census Bureau recently announced it would accelerate the release of its prison count data so that states can more readily identify prison populations in the Census. This federal change will be helpful to states such as Delaware that wish to make their own adjustments. The Prison Policy Initiative and Demos applaud the lead sponsor of the legislation, Rep. Helene Keeley, additional sponsors Rep. J. Johnson, Rep. D.P. Williams & Sen. Henry and cosponsors Reps. Barbieri, Brady, Hudson, Mitchell, and Sens. Marshall, McDowell. Indeed, although Senator Henry represents a legislative district that contains a prison currently counted as part of her district, she and other legislators recognized that the issue of fairness and accuracy in statewide redistricting should take precedence over individual concerns. The Prison Policy Initiative and Demos are also encouraged by the bi-partisan support for the bill, including the unanimous support it received in the House, and the support of half of the state’s six Republican senators.